I am having a thing for this new neutral. Blush. I used to avoid pinky shades, as my red hair/fair skin colouring can look a bit washed out. However, I am liking that it's a bit different, but still able to work with a lot of outfits. I got the Rebecca Minkoff Rose Gold Mab over the winter and love it. It's the perfect work tote. I wanted to give it a bit of a break, so I recently picked up this Zara Tassel Bucket Bag for more casual occasions. It's a true pink, but again works as well as a neutral. Plus, the bucket bag trend is still going strong. This one has a bit of a different shape & zips. It's a small bag in my mind, though objectively I will say it's medium. It's nice to have something a little lighter for summer. It's in the sale (hopefully still) for a deal. I have gotten so many compliments on it-so check it out. The pom-pom key chain is from H&M. 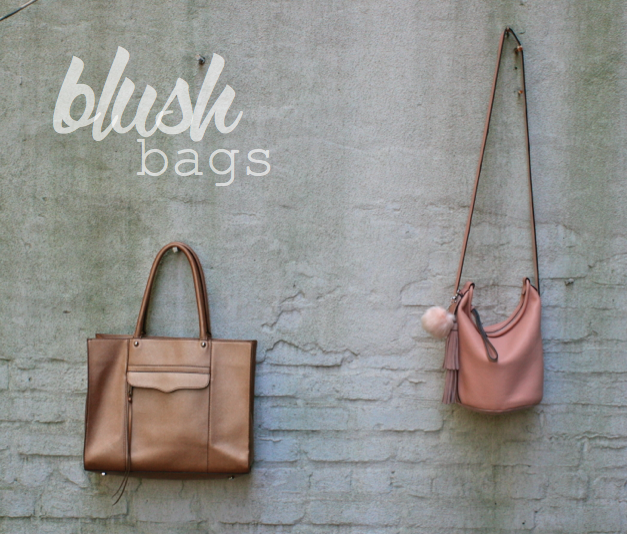 Are you a fan of pink bags?